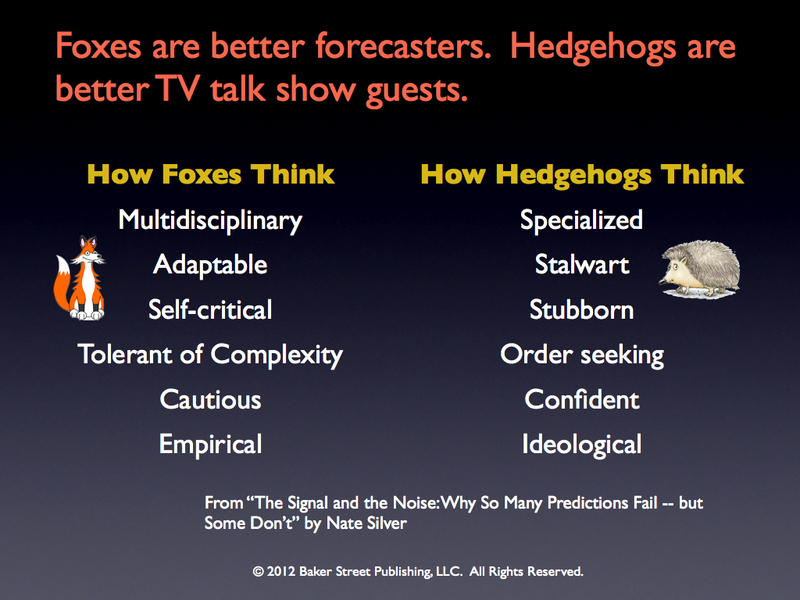 Decision Coaching 3.0: Is it better to be a fox or a hedgehog? 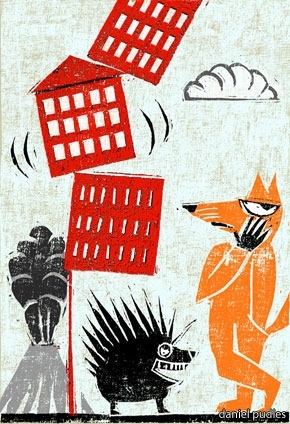 The Signal and the Noise is a book about prediction, not politics. Prediction and forecasting has always been in a sorry state. Important events like the housing crash don’t make it onto the popular radar screen even though there are warnings by wise people. Economic forecasters and rating agencies continue with their precise estimates of important variables like next month’s unemployment and interest rates. The press and the public gobble up the precise estimates as though they were based on the laws of physics. Silver believes in the value of expressing expert judgment as probabilities. Further, he believes in updating probabilities in a normative way. He does a nice job of explaining the Bayesian philosophy and demonstrates its power with several examples in the book. As decision coaches we need to know how to express the uncertainty in the predictions we use. True to Bayes’ Rule we need to be able to update forecasts as facts and circumstances change. We need to encourage teams to see the world from multiple viewpoints. The more we can do these things the more useful we will be. This is an important, entertaining book. I hope you enjoy it. Baker Street posts about 2 times per month on topics of interest to decision coaches. If you would like to receive these posts automatically by e-mail, just submit your address here.